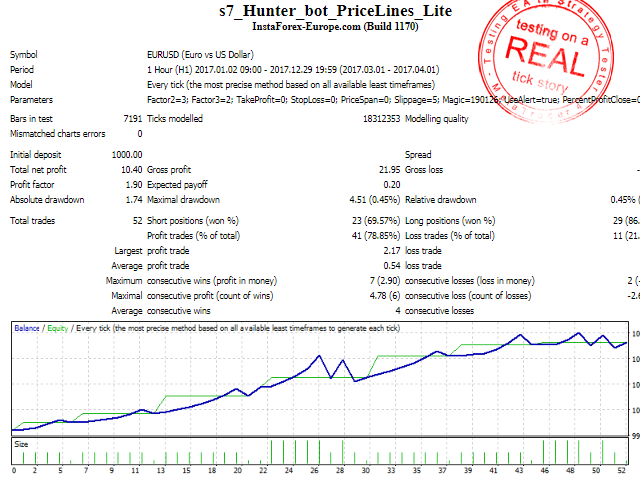 This easy version is intended for acquaintance with the full-function version (Hunter bot PriceLines Extra) and contains the minimum set of parameters for control. This robot - development of the adviser of Hunter on the channel breakout Bot. The adviser (EA) is intended for automatic trade. It exposes every day the postponed warrants of BuyStop and SellStop with the set StopLoss and TakeProfit levels. The adviser counts width of the channel and exposes the postponed warrants of BuyStop and SellStop according to the set settings. The postponed warrants of BuyStop and SellStop can be exposed at the set distance from borders of the channel. This distance is set in parameters in points from the calculated width of the channel. For each warrant it is possible to specify the StopLoss and TakeProfit levels (are set in parameters). The adviser distinguishes two-three and four-five-digit quotations. In parameters of value are specified in points (the second or fourth sign after a comma). The adviser works on any tool and with any period (TF). In the adviser it is possible to set number of the expert for filtration of the warrants from strangers. It is possible to establish the adviser on different schedules with one tool, but different settings. In that case it is necessary to specify excellent numbers for each schedule. If the tool on schedules different, number it is possible not to change - the confusion will not be. In drawings the example of control of the adviser and his check in a tester of strategy is presented. Testing was held on real tics. For the test the period in a month and in a year is taken. 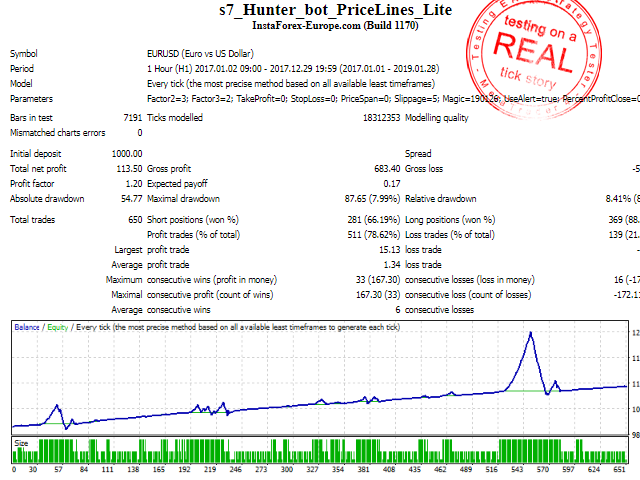 Parameters are exposed without selection and without optimization: Lots=0.01; TakeProfit=0; StopLoss=0; PriceSpan=0; TimeStart= "01:00"; TimeEnd= "23:30"; PercentProfitClose=0.1.